When traversing the web, you'll regularly come across websites that require you to create an account. With the majority of these accounts, protection is limited to a simple password. Despite this, many people are still using weak passwords such "123456." For these reasons, you really need a password manager, and our research has shown that LastPass is still your best bet. Besides the obvious bad passwords, many folks use passwords that are easy to remember, which unfortunately means they're also easy to guess. This problem compounds itself when you reuse this same password for multiple accounts, making them all susceptible to a breach. A password manager solves both of these problems, and several more. Whether you're on Android or iOS, there's no better choice for a password manager than LastPass. 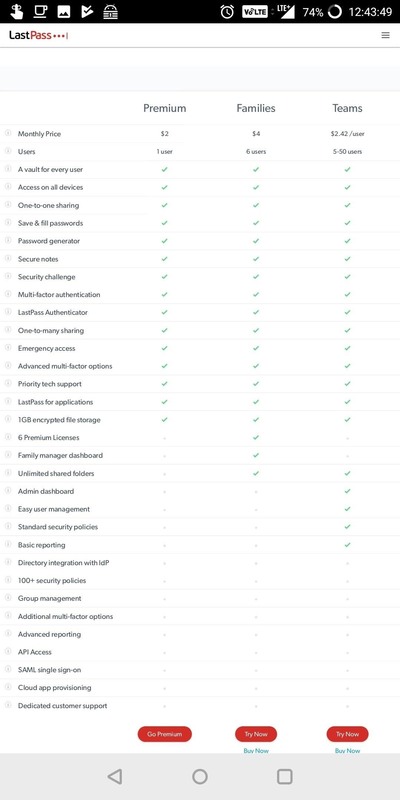 We recently did in-depth comparisons for the top managers on both major mobile operating systems, and LastPass came out on top both times. So below, I'll highlight just a few of the reasons LastPass stands out. LastPass is easily one of the cheapest premium password managers. While there is a free version, most of the features are behind a paywall. Luckily, LastPass's pricing is low enough that for many, paying the subscription fee won't be a problem. For a single-user, LastPass costs $24 a year. To put that in perspective, most of its competition charges around $8 more a year. 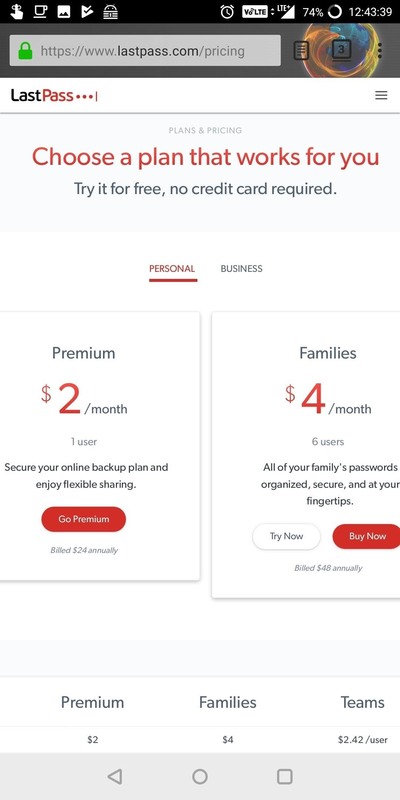 And for families, LastPass has an even better deal. For $48 a year (or the price of two single-user accounts), you'll get access to all the premium features with six licenses. Finally, for those users who wish not to pay at all, the free version has one feature normally reserved for a premium account, cloud synchronization. Users can access their vault on whatever device they own with each copy of vault perfectly in sync with all the other copies. Really, password managers are only useful as long as they're convenient. 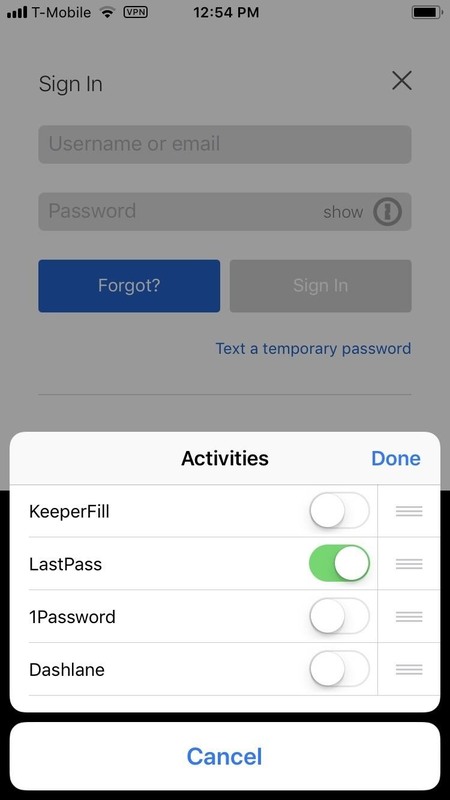 Some apps will make you log into the password manager, then find the account within the database, copy the username, open the app you want to sign into, paste the username, return to the manager, copy the password, return to the app, and paste the password. However, this process is a lot easier when your password manager has a good autofill feature. For iOS users, LastPass uses Share Sheets to make autofill possible. Simply tap the share button from the login page in any compatible app, then select LastPass, which will find the text boxes and autofill the information. Using this method, users can autofill both in their apps and in their browsers. For Android, there are two methods that depend on the version of Android you are using. 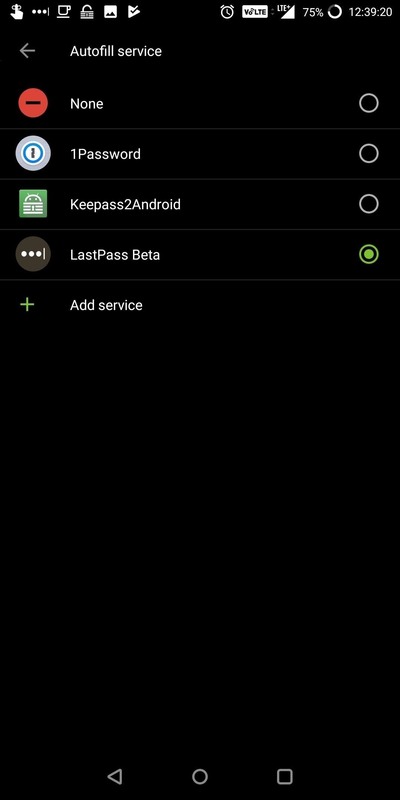 For the majority of users who run an outdated version of Android (Nougat and older), LastPass autofills using an Accessibility Service. 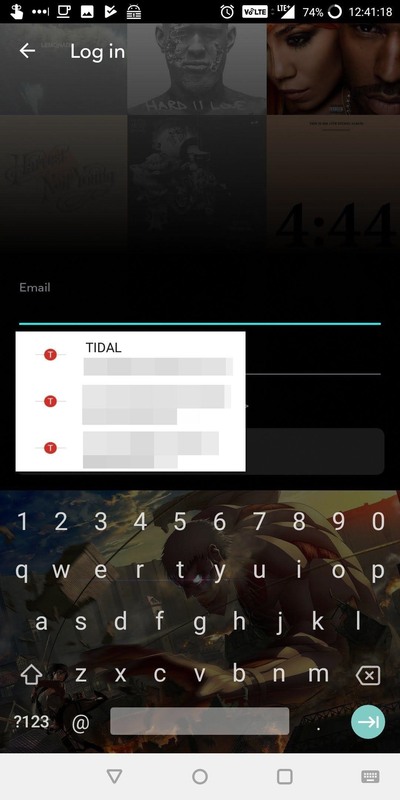 However, for people running Android 8.0 or higher, autofill is even easier. Users only need to choose LastPass as their autofill service of choice, then passwords from their vault will be populated into login fields. One of the most important criteria when comparing password managers is security. No matter how convenient a manager is, if your vault isn't properly secured, you are more vulnerable than if you didn't use a password manager in the first place. Fortunately, most password managers use the latest encryption standards, but what gives LastPass an edge is its wide support for multi-factor authentication. Muti-factor authentication is when an app or service requires more than just your password to log in. The idea is that a hacker can learn your password (especially if it is weak) and gain full access to your account. However, if you enable an additional layer of security, such as a one-time password that gets sent to your phone number via SMS, hackers would need to hack that as well to gain access. One of the most popular forms of this security measure is a third-party authenticator. 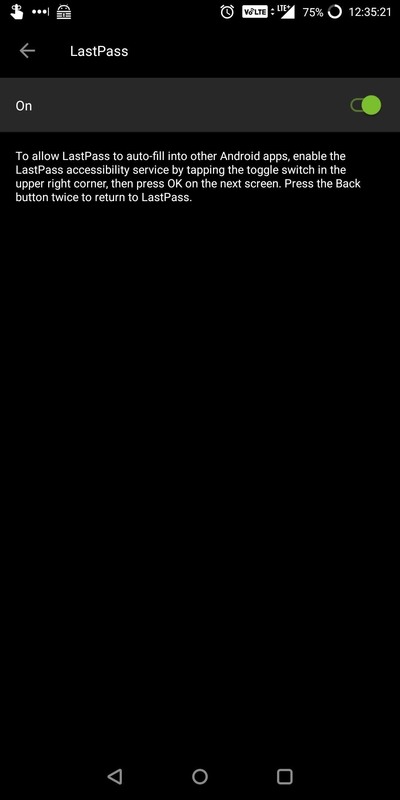 This is a separate app or service that will receive your one-time password, which you'll then have to enter in addition to your regular user name or password before you can log in. With LastPass, there's an abundance of app-based and software-based authenticators to choose from. 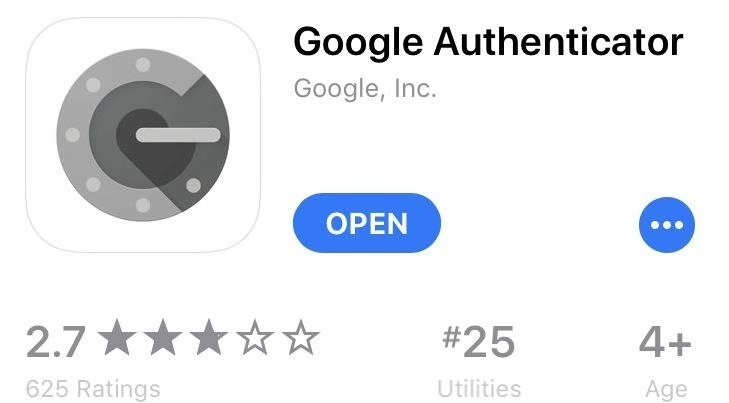 All the major app-based authenticators are available, including Google Authenticator (Android and iOS), and Authy (Android and iOS). In addition, LastPass supports hardware-based options such as YubiKey, which require you to physically have something in order to log in to your account. Finally, LastPass has a zero-knowledge policy. LastPass doesn't know, transfer, or store your master password. Since encryption of your vault is based on your master password, this means even LastPass themselves can never access your vault. Therefore, even if LastPass was hacked, your database won't be compromised, as the hackers would need to know your master password to unlock it. The integrity of any password depends both on the strength of the password and its age. For example, a strong password loses its strength if the same password is used for several years. The longer the password is used, the greater the amount of time a hacker has to reveal it. A general recommendation is to change your password every 90 to 180 days. While this is difficult to accomplish on your own, LastPass makes it easy. 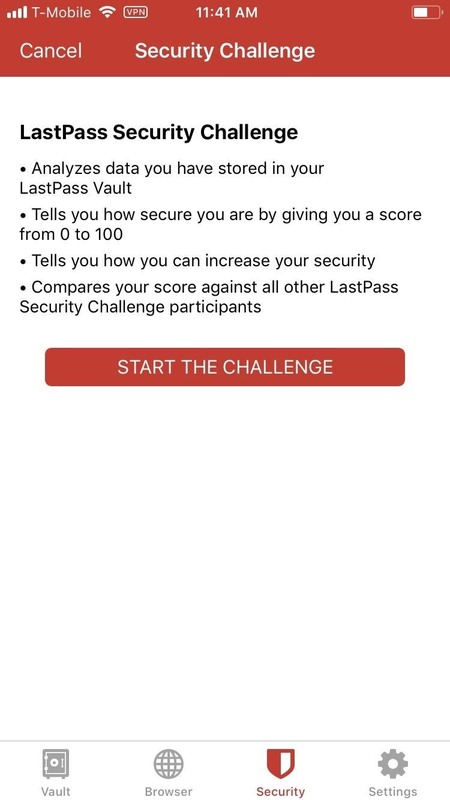 LastPass' Security Challenge audits your passwords (including your master password) and grades the overall security of your vault using a 0-100% scaling. LastPass' grading is based on the strength of each password, how often you repeat password, and the average age of each one. 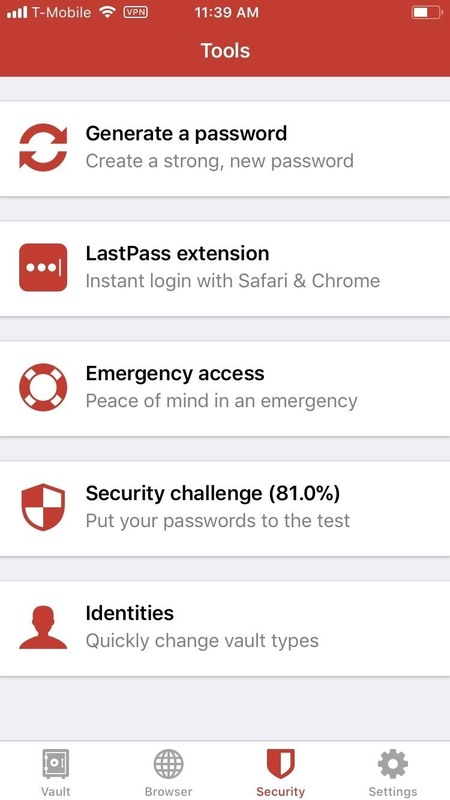 After evaluation, LastPass provides suggestions to improve your score. 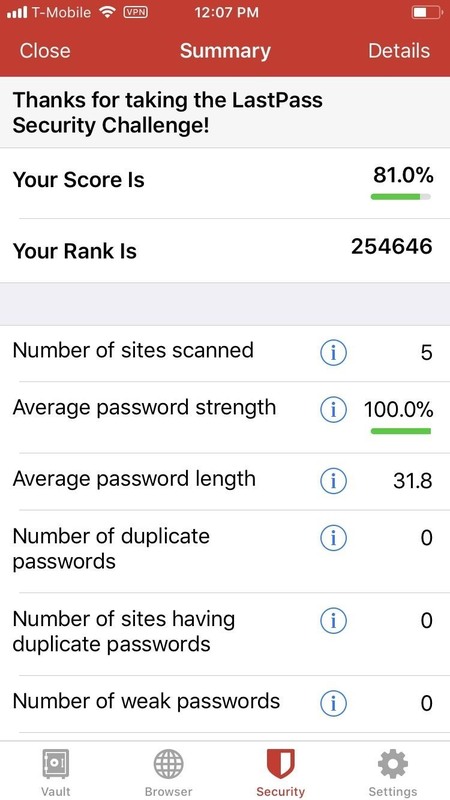 The numerical scoring does two things: It provides a measurable goal which users can try to achieve and offers an easy-to-understand analysis of the strength of your passwords. LastPass includes an abundance of features that, while perhaps not essential to the basic functionality of a password manager, enhance the experience in a way that makes them quite valuable. One such feature is shareable passwords. Especially for business accounts and families, users want to be able to share a password with another trusted individual. Instead of having to hound the owner of the account for their credentials every time they want to log in, users can share passwords (both individually or as a group) to authorized individuals and control the way those individuals use them. 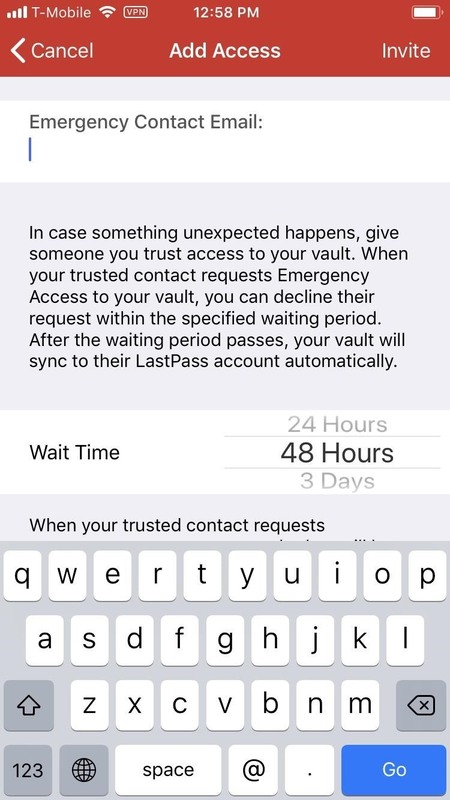 Another major feature is Emergency Access, which lets you provide account access to a list of trusted loved ones in the event you become unable to manage your own accounts (such as death). For more information on this thoughtful feature, check out the link below. Don't Miss: When Happens to Your Password When You Die? In this day of age, not using a password manager is dangerous. It provides one of the best counters to hacking, minimizing the risk of your data becoming compromised. No software is perfectly secured, so you should expect that a hack could happen at any moment. With a password manager, you have another great tool at your disposal to combat against this. 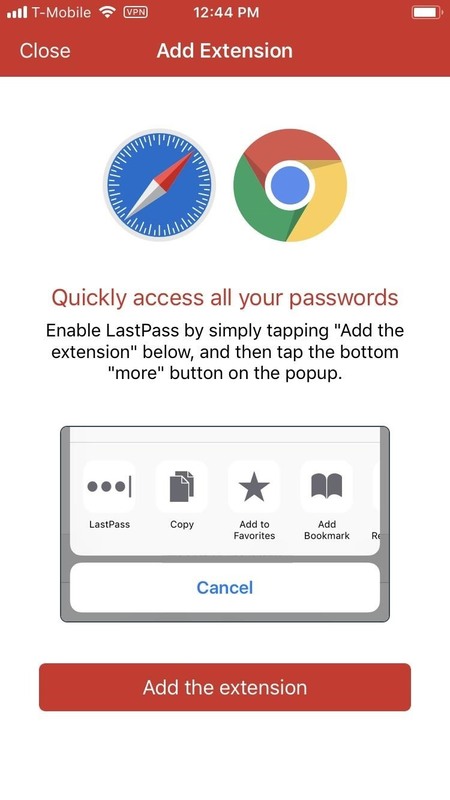 After thoroughly testing the most popular password managers, we concluded that LastPass reigns supreme no matter which side the mobile OS fence you're on. LastPass' combination of low pricing, great features, and a secure platform makes it the ideal choice for any mobile users. Which password manager are you using? Let us know in the comment below. How To: What Happens to Your Passwords When You Die? How To: How Long Would It Take to Crack Your Password? I love how you have KeeperFill listed in your screen shot. Shows that you've tried a better password manager. It's got 10x's as many mobile downloads as LastPass. I wonder how much they paid you for your review?